Tags: Antique Map, Asia, India. 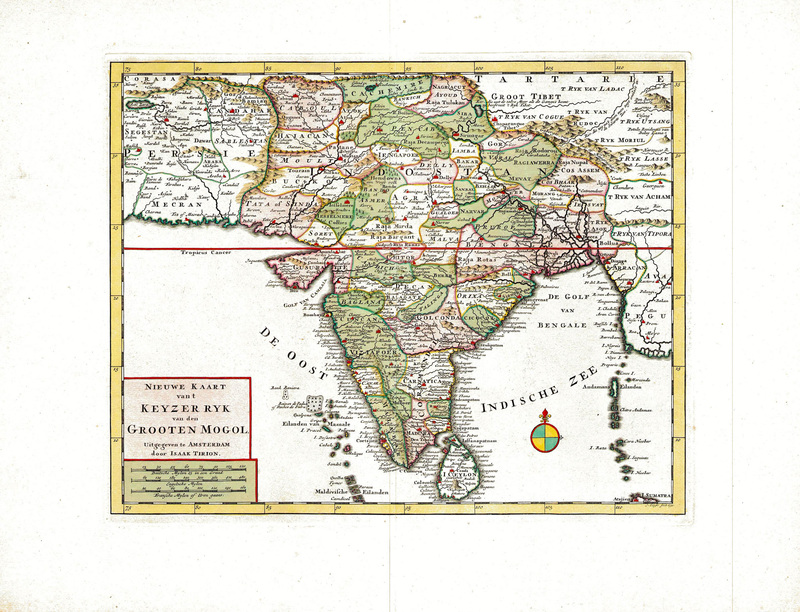 Antique Map India by Tirion titled ‘INDIA NIEUWE KAART VANT KEYZER RYK VAN DEN GROOTEN MOGOL’. Detailed and decorative map of India. The map extends from the Candahar region and Lake Zara to Tibet, and south to Ceylon. This plate originates from: ‘Hedendaagsche Historie, of tegenwoordige staat van alle volkeren … II deel …’, published by Isaak Tirion, Amsterdam, 1731. This is in fact an amended Dutch edition of: ‘Modern History: or the Present State of all Nations.’, published by Thomas Salmon since 1725. German, Italian and Dutch editions were published as well. This monumental Dutch edition, translated by M. van Gogh and published by Isaac Tirion, was much amended and enlarged into a 39 volume series. This plate originates from the third volume from this series which deals with: Pegu, Ava, Arrakan, Acham, India / mogul emprire, Malabar, Coromandel and Ceylon / Sri Lanka. This plate is from the section on India. Dimensions: 300 x 380 mm. Condition: Very good, attractive colour.